Every year in February, Americans revisit their Roman numerals to figure out what edition of the Super Bowl it is. (FYI, XLVIII = 48.) But there are some other numbers surrounding the big game that you might not know about. With less than a week to go before the nation’s biggest sporting event, let’s take a look at some Super Bowl numbers that may surprise you. NFL teams operate under a league-wide hard salary cap—in other words, the NFL imposes a total salary figure that all 32 of its teams must operate under. This year’s Super Bowl features teams with two of the top three cap figures in the league (the highest belongs to the Kansas City Chiefs). 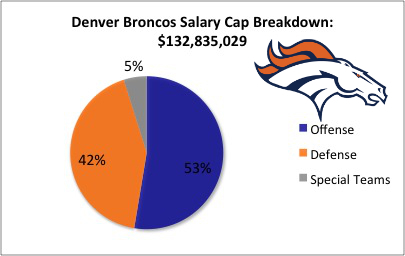 According to spotrac.com’s salary data, the 2013 Denver Broncos had a payroll that resulted in a total adjusted cap figure of $132,835,029. Of that total, 53 percent was spent on offensive players, the highest-paid of whom is none other than star quarterback Peyton Manning. The Broncos’ second-highest-paid player is Champ Bailey, a defensive player and one of the best cornerbacks of his generation. 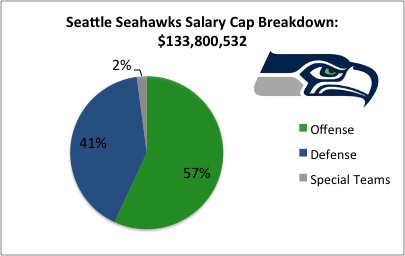 A look at Seattle’s salary distribution shows, perhaps surprisingly, that they allocate more of their payroll for offense than Denver does. Of their $133,800,532 total cap figure, 57 percent has been spent on offense, while 41 percent went into forming their vaunted defense. Interestingly, One of Seattle’s highest-paid players is wide receiver Sidney Rice, who won’t even be playing in the Super Bowl as he’s recovering from an ACL tear suffered in October. Seattle’s starting quarterback is Russell Wilson, who in his second season makes just 3.5 percent of Manning’s base salary: $526,217 vs. $15,000,000. And cornerback Richard Sherman, the hottest name in the sports stratosphere these days, has a base salary of $555,000, which is 5.8 percent of Bailey’s salary. On average, offensive players in the NFL almost always make more money than defensive players, especially quarterbacks and offensive linemen (i.e., the ones protecting the quarterback). While Denver pays its quarterback a significant amount more than Seattle does its passer, the Seahawks can complement Wilson with running backs, receivers and tight ends who are paid more than Manning’s offensive counterparts. The Seahawks also boast a younger defense—indeed, the entire team is the second-youngest in Super Bowl history—than the Broncos, and key players such as Sherman and Earl Thomas are still on their rookie contracts and are yet to receive their big paydays. 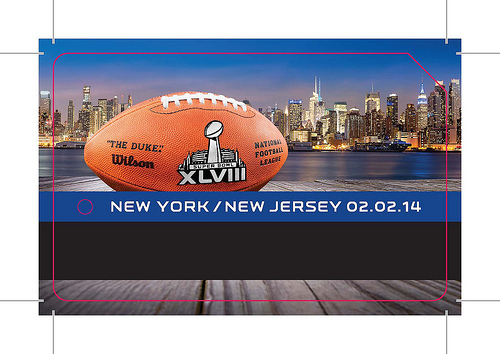 This year’s big game will be played in the largest metropolitan area in the country. All sorts of numbers have been thrown out regarding the economic impact of Super Bowl XLVIII on the Greater New York City area—the NFL and politicians in New Jersey and New York have claimed the event will generate between $500 million and $600 million for the local economy. But many economists have disputed this largely unscientific figure. And studies have revealed that in the past, the NFL’s estimates have been inflated by as much as four times the actual level of financial impact on host cities. The problem with the figures reported by the NFL and the New York/New Jersey Super Bowl Host Committee is that they consider all spending associated with the Super Bowl as part of the overall economic impact. However, much of the spending that occurs does not directly improve the local economy, as visitors aren’t necessarily buying what the local economy is selling—for example, most visitors stay at major national hotel chains in the area and don’t necessarily consume much from local businesses. Using past data, we project that Super Bowl XLVIII’s financial impact on the New Jersey and New York area resulting from direct spending will be about $194 million, which is about 60-70 percent less than the estimates claimed by the NFL and the host committee. It seems strange to use the word “underpaid” when talking about men who make millions of dollars to play a game, but relatively speaking, the average NFL player makes a much lower per-game salary in the playoffs than in the regular season. Players on the Super Bowl-winning team will make $92,000 apiece for the game, while those on the losing team will make half that—$46,000. Another interesting caveat of the NFL postseason pay structure is that players on the Broncos and Seahawks—the teams with the best records this season—actually could have made more money had their respective teams been a bit worse during the regular season. The most a player could have made in this year’s postseason (if that player was on a division-winning team that played in the wild-card round and won the Super Bowl) is $180,000—which is barely more for four total games than what the average player made in a single regular-season game this season. Since the Broncos and Seahawks were the best in the NFL all year, they received a first-round bye in the playoffs and didn’t have to play in a wild-card game. However, this meant that both teams’ players also had to forego the $21,000 or $23,000 they could have made if the teams were just a little bit worse during the regular season and had to play in the first round. Still planning your Super Bowl trip? You should know that you’ll be paying a premium for almost everything—from the high-priced tickets to hotel accommodations, costs have seen a super-sized markup, and the generally high cost of living in the Big Apple doesn’t help, either. Using prices from hotels.com, we calculated that this weekend’s hotel prices in the Greater New York City area are more than twice as high as the prices for rooms available the weekend following the Super Bowl (Feb. 7-10). A comparison of hotel prices show that hotel rooms during Super Bowl weekend cost 100.8 percent more per night than they do the very next weekend. For example, a room at the Courtyard by Marriott in Manhattan/Times Square will cost you $399 per night this weekend but just $179 per night a week later. If you’re looking to stay closer to MetLife Stadium, a room at the Holiday Inn Express in East Rutherford, N.J., will cost you $233 per night, compared to just $112 a night the next week. With only a few days left before the big game, you’ll likely pay a hefty price on a hotel if you’re planning to make the trip to New Jersey. At this point, you should at least compare this weekend’s prices with other weekends to hunt for a hotel with a less than 101 percent markup and find the best relative deal you can. NFL player salary data obtained from spotrac.com. 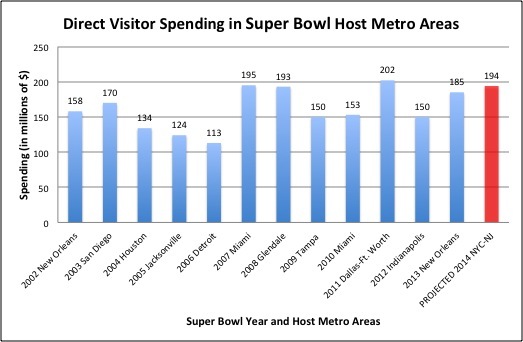 Direct Visitor Super Bowl Spending in 2002-2013 data obtained from PricewaterhouseCoopersLLP. Postseason salary structure data obtained from NFL Super Bowl XLVIII Postseason Media Guide. Hotel prices obtained from hotels.com. Super Bowl XLVIII image from MTAPhotos.